The main goal of a landing page is to convert visitors into customers, therefore the layout is specially designed and fitted with a variety of features that will make that happen. Coupled with a structure that’s highly customizable, this product will be perfect for your product, service or company presentation. This is great, i’m definitely gonna use it for my projects. I love the fact that it has so many templates to choose from. Great work! I’ve been using this file, it’s so easy to work with and I love the look of it. Great job! Hi Adi – I panicked when I realized I had purchased a template I thought was native for WordPress only to discover that it was HTML … HOWEVER , your code is so solid and well-organized that it was a snap for even an HTML novice like me to create what I needed – well done and thank you! 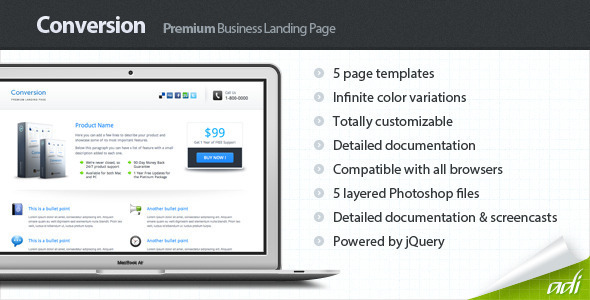 A much more complex, HTML theme based on the landing page, is available for sale here.